Sequels are hard. There is always the inevitable sense of not living up to what came before, so rare is the sequel that manages to be a true equal of it's predecessor. Guardians of the Galaxy Vol. 2 manages to be just as fun, just as thrilling as the first movie, while being more emotional and dare I say it, sweet? in ways that you don't expect. 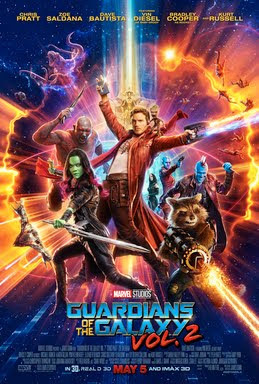 The movie opens with the Guardians working a job for the Sovereign race protecting a bunch of interstellar batteries that a monster is attempting to eat. After the usual chaos and shenanigans, the Guardians get the job done, their reason for taking the job is revealed: they're doing so to get their hands on Nebula, Gamora's assassin sister, who was in the custody of the Sovereign for attempting to steal the batteries that the Guardians were protecting. Turns out that Rocket Raccoon can't help himself and steals some as well, which sets the Sovereign and their drone fleet on the Guardians. After evading the Sovereign fleet in a nebula, the Guardians get some help from a mysterious ship that wipes out the Sovereign drone fleet and then comes down to land near where the Guardians had crash landed. Turns out, the mysterious ship belongs to none other than Ego and his companion, Mantis and Ego has been searching for Peter Quill for a very long time and introduces himself as Quill's father. Quill, Gamora and Drax all agree to accompany ego back to his home planet, while Rocket and Groot remain behind to repair the Guardians' ship and guard Nebula. Meanwhile, the leader of the Sovereign, Ayesha tracks down and hires Yondu and his Ravager crew to recapture the Guardians. Turns out they've been exiled from the larger Ravager community for trafficking in children (the Ravagers, as it turns out, have some standards, which is good, I guess?). Yondu takes the job, tracks down the Guardians and successfully captures their ship, Rocket, Groot and Nebula, but when Yondu expresses reluctance to turn over Quill to the Sovereign, his crew mutinies, lead by Taserface and encouraged by Nebula. On Ego's planet, Gamora and the others can't shake the feeling that there's more to Ego than he's letting on- but Quill is eager to learn about his father. Turns out Ego is a celestial and after millions of years alone, he realized that in order to evolve, he needs to expand. So he spent years spreading his seed and impregnating women on hundreds of planets, trying to transfer his 'celestial' DNA to one of them so they could combine powers and activate all the seedlings. Turns out Quill is the only one of the children that's managed to carry his DNA and his expansion plans can only work if their powers combine. Everything starts to come together after that- Yondu, Rocket, Groot and Kraglin take back the Ravager ship and go and track down Quill on Ego's planet. Nebula shows up as well, ostensibly to take her revenge on Gamora, blaming her for the torture that their father inflicted on her and that's when the big plot twist goes down: turns out all those other children that didn't have the celestial DNA? Ego killed them. And his 'expansion' plans? They'll destroy all the planets he seeded and oh by the way, Quill as well. That kicks off one final showdown with Ego (who is actually his entire living planet) and in the end, it's Yondu who sacrifices himself to save Quill, helping to realize that there is a difference between being someone's father and being their Dad.